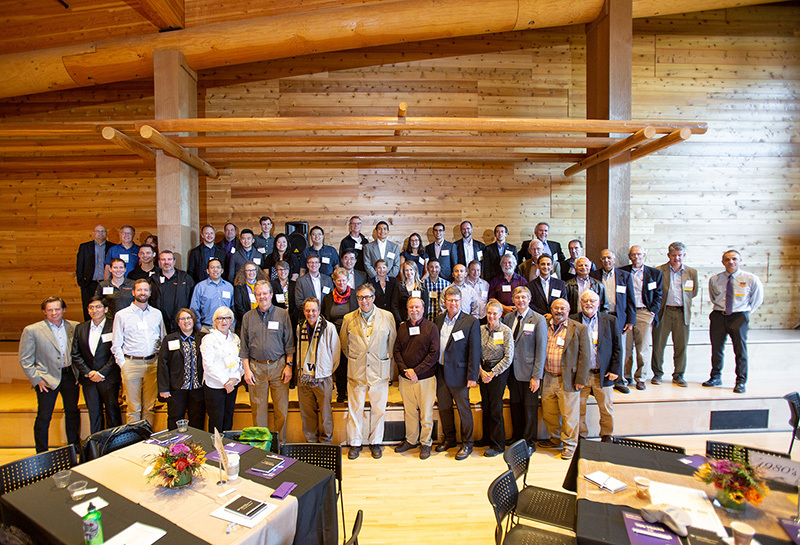 The College of Engineering and its William E. Boeing Department of Aeronautics & Astronautics (A&A) celebrated 100 years of aeronautics instruction, bringing together for a day-long event Boeing executives, UW leaders, current and former faculty, partners and alumni. UW President Ana Mari Cauce kicked off the event, praising A&A for being an innovator in interdisciplinary initiatives. 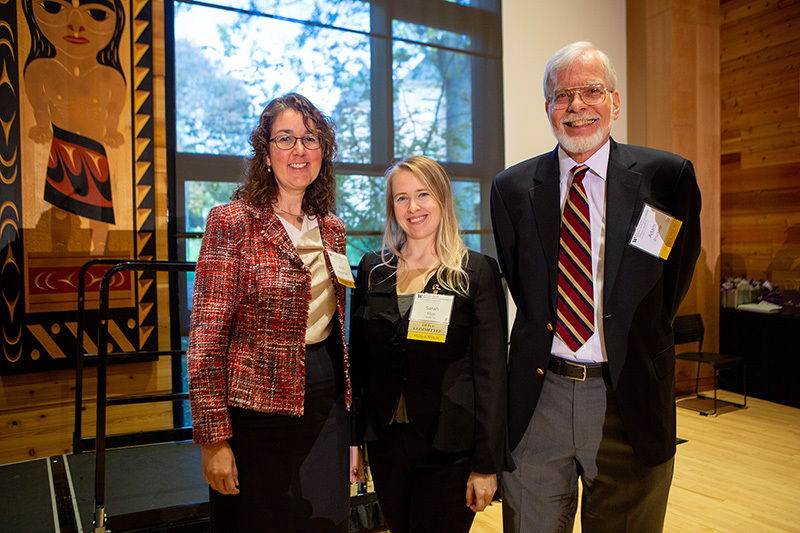 A&A Interim Chair Kristi Morgansen, Boeing Commercial Airplanes Engineering Historian Sarah Musi, and A&A Professor Emeritus Adam Bruckner related the history of aeronautics at UW and the close connection with Boeing. Aeronautics instruction began at UW with William E. Boeing’s gift of the original wind tunnel in 1918. Founder of a budding company, which UW Engineering Dean Mike Bragg dubbed “one of the original aerospace startup companies,” Boeing realized he would need skilled aeronautics engineers and a testing tunnel for designs. The gift of the wind tunnel would achieve both as UW would use it to train aeronautics engineers as well as provide wind tunnel services to the Boeing Company. To mark this centennial of the close collaboration between UW and Boeing, Boeing CTO Greg Hyslop reported that Boeing currently employs over 9000 UW alumni, including 6000 from the College of Engineering. The UW alumni hires began in 1916 with mechanical engineering graduates Clairmont Egtvedt and Philip Johnson, both of whom eventually served as Boeing presidents. 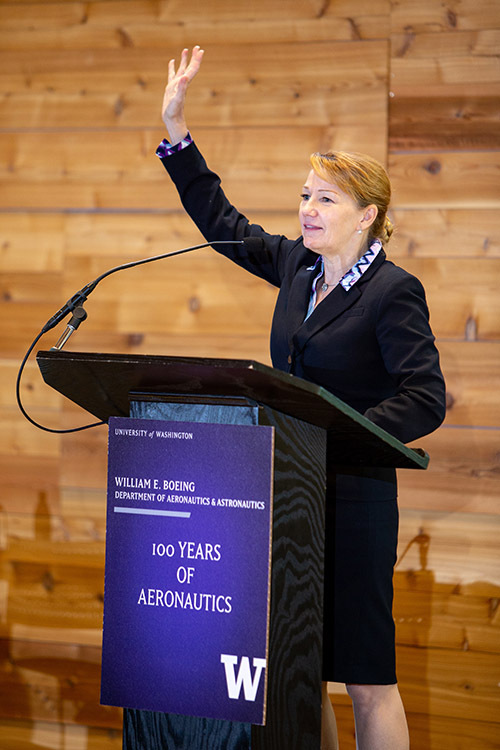 Boeing Commercial Airplanes Engineering Historian Sarah Musi teamed up with A&A Former Chair and Professor Emeritus Adam Bruckner to tell the extended history of the UW -- Boeing connections and the effect of World War I on the state of aeronautics in 1918. Bruckner revealed that the original UW plans for the wind tunnel labeled the still-standing building as a “temporary testing shed.” In addition, Guggenheim Hall was funded through a $290,000 grant from the Guggenheim Fund for the Promotion of Aeronautics in 1928 and housed not only the Aeronautics department, but also Electrical and Civil Engineering, the Engineering Library, and the Dean’s Office. A&A Interim Chair Kristi Morgansen highlighted the A&A programs through today, including many dynamic research efforts and centers: the Space Policy and Research Center (SPARC), the Boeing Advanced Research Center (BARC), the A&A Capstone Projects, the Society for Advance Rocket Propulsion (SARP) and the upcoming Advanced Composites Center. The Future of Aeronautics Panel. 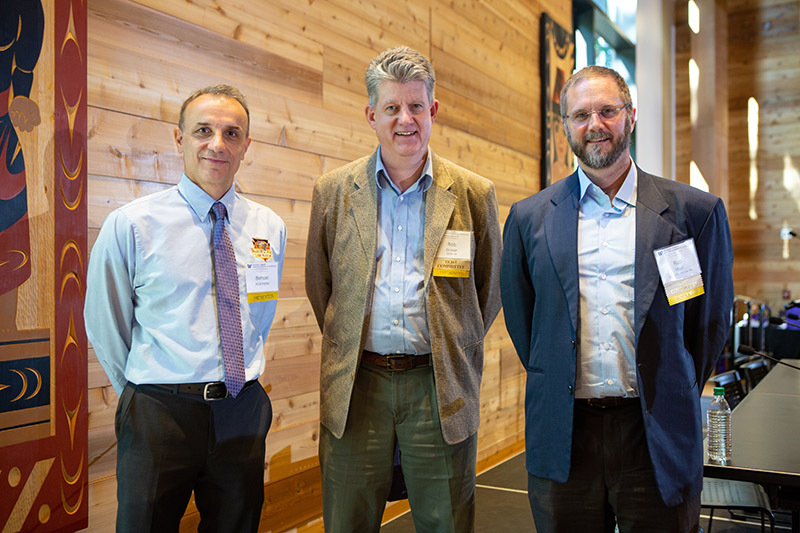 From L-R: A&A Professor Eli Livne, Boeing CTO Greg Hyslop, Former Boeing CEO Phil Condit, and UW Engineering Dean Michael Bragg. 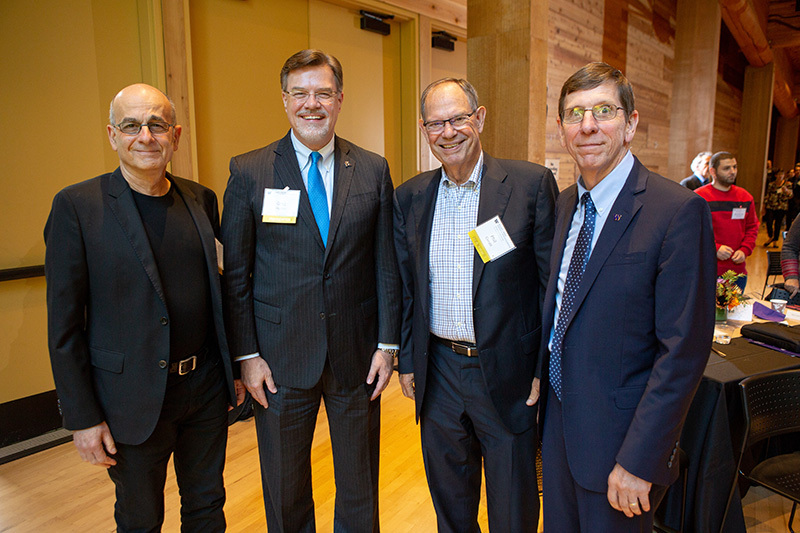 In a panel moderated by Engineering Dean Mike Bragg, Hyslop was joined by his colleague former Boeing CEO Phil Condit and A&A Professor Eli Livne to discuss their take on the current challenges leading us to the future of aeronautics. Condit emphasized the need to bring the cost of manufacturing down. He said, “Aerospace is unique in that it is high technology with a long product lifestyle. The 747 flew in 1969 and is still in production. Having said that, the challenge is that these devices are extraordinarily expensive. How do we think of the design of manufacturing to reduce the cost of the product?” He continued that the new technologies, such as 3D printing with metals and other materials will be a piece of the solution. Livne spoke of those features of aeronautics that, in his view, will continue to drive the field: The optimal integration of form and function; the complexity of the multidisciplinary interactions involved; the bypassing of transportation obstacles on the ground; and the “bird’s eye view” it provides. He also talked about the “awe factor” of flight vehicles and the importance of sustained investment in aeronautical engineering education and in the development of commercial supersonic flight. Future of Space panelists: A&A Professor Behcet Acikmese, JPL’s Rob Grover, and CEO of Tethers Unlimited Rob Hoyt. 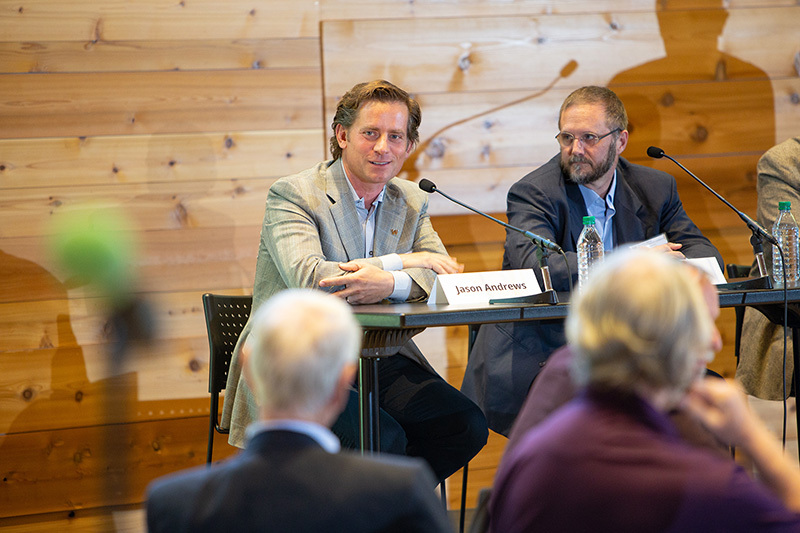 A&A Professor Behcet Acikmese moderated a lively all-alumni panel on the Future of Space with CEO of Spaceflight Industries Jason Andrews, CEO of Tethers Unlimited Rob Hoyt, and Rob Grover from the Jet Propulsion Lab. All of the panelists spoke of the shrinking of space technologies in that we are developing smaller, higher-functioning satellites closer to earth made of parts at a lower cost. For the future, CubeSats will be a big part of planetary exploration, and the challenge that we are starting to overcome is reaching an economy of scale to launch more, smaller space systems at a lower production cost. A&A recognized Laura McGill, VP of Raytheon Missile Systems, as the 2018 Distinguished Alumna. In addition to the honorary stole presentation recognizing the 50 Year Reunion Classes from 1968 and 1969, A&A recognized Laura McGill from the graduating class of 1983 as the 2018 Distinguished Alumna. McGill, VP of Engineering for Raytheon Missile Systems, fondly remembered her time as an A&A undergraduate. She noted that smoking was still allowed and when “things got difficult, labs got smokier.” She also remembered that she and her classmates were very tied to current events. They followed the testing of the space shuttle on the 747 and watched the launch of Columbia. After the May 1979 crash of the DC10 in Chicago, they did wind tunnel testing of Boeing airplanes under similar stresses. The centennial gathered many A&A alumni. The centennial event was, above all, a celebration of A&A’s influence in the world personified through its alumni. We heard from alumni from each decade since the 1950s talk about the state of technology when they were in school and their favorite memories. Alumnus Kourosh Hadi, Director of Product Development for Boeing Commercial Airplanes and the Boeing Focal for the A&A Department, fondly remembered putting in many hours working at the wind tunnel and his first class with Bruckner requiring several all-nighters. 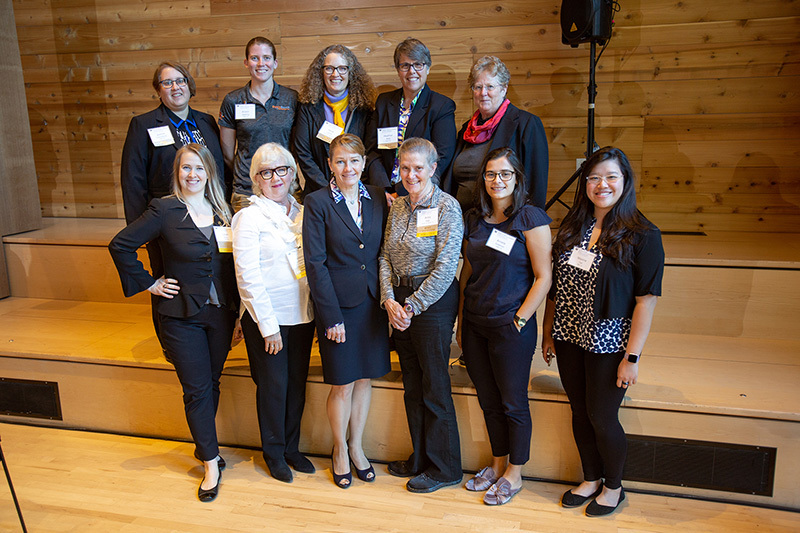 Says Morgansen, "The event was a clear demonstration of the amazing base of alumni and partners that we have developed over the hundred years of our department. We will definitely be engaging that enthusiasm for even more success as we continue into our next hundred years." The Alumni Panel gathered graduates from the 1951 through 2002 classes. 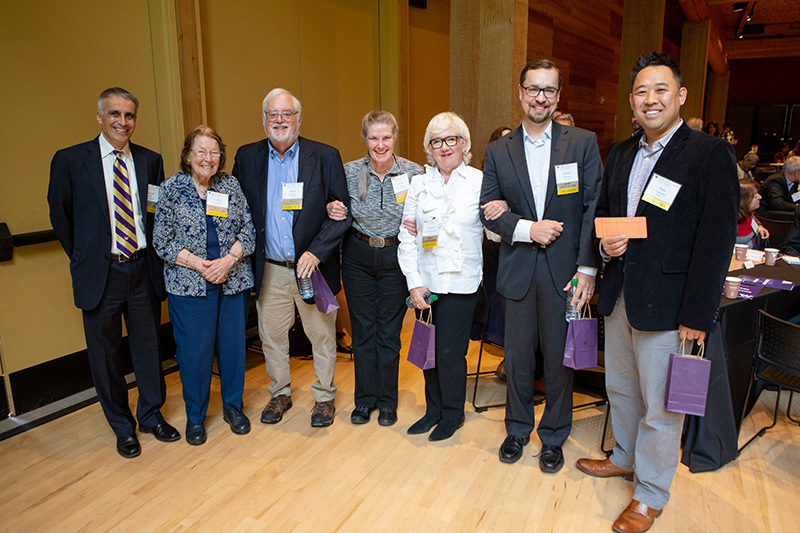 L-R: Kourosh Hadi, Luella Armstrong, Dana Andrews, Anita Gale, Suzanna Darcy-Hennemann, Emilio Beltran, Kyu Hwang. 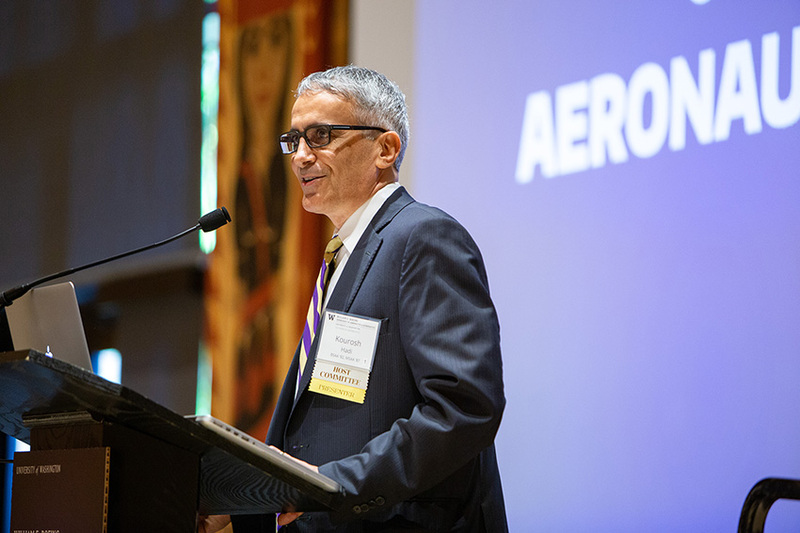 Director of Product Development for Boeing Commercial Airplanes and A&A Boeing Focal (and A&A alumnus) Kourosh Hadi welcomed the crowd and moderated the lively Alumni Panel during the event. 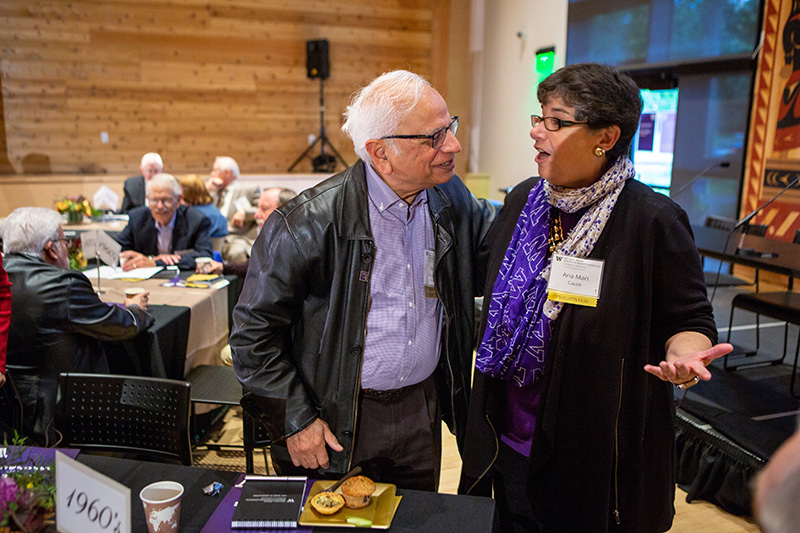 UW President Ana Mari Cauce chats with our very special A&A alumnus Rao Varanasi. 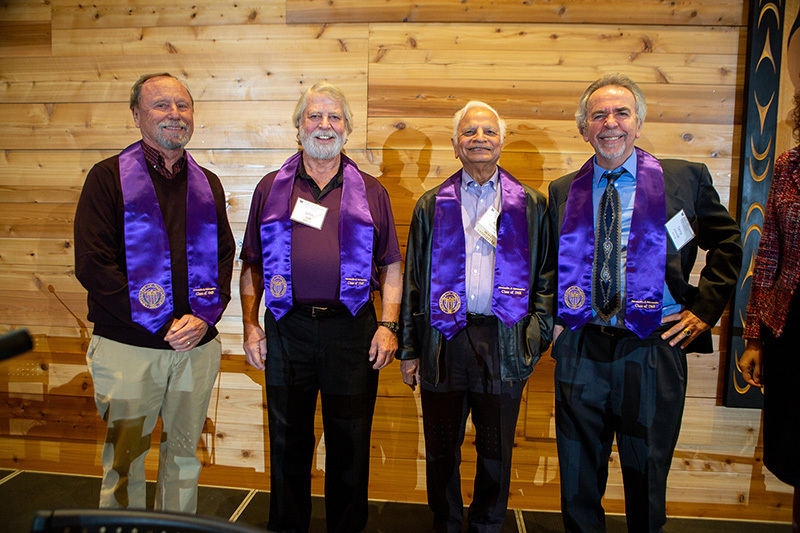 The Stole Ceremony recognized graduates celebrating their 50th year as alumni from the classes of 1968 and 1969. From L-R: Robert Spurrell, John Redl, Rao Varanasi, Terry Schmidt. CEO of Spaceflight Industries Jason Andrews during the Future of Space Panel. Alumnae gathered for a photo.